Feedback from the Swedish Sailing Federation has been received. 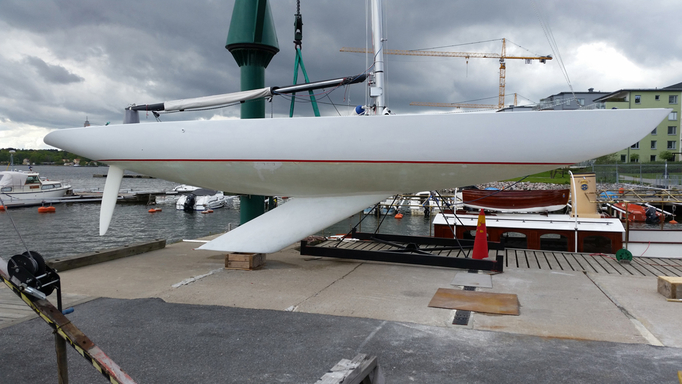 This boat has - after participating in the Norwegian Open - found its harbour in Lidingö, Stockholm. This is Luders design #1097 and it is L5.5#71 of 72. Warren Muir is not the designer, he built the boat. Owners are Frode Halvorsen & Hanne Kraft-Johanssen. Location is Risör. The right sail number should be BA-8. Bobby Symonette maybe had some good sails from John B6. Bobby was practical. He just took the sail with letters BA-1 and added number 1 and a new registry number BA-11 was born. He just forgot the numbers 8, 9 and 10! Warning : dates of ownership changes you could read her on the right are approximated on purpose and set up like this only to respect the chronological ownership order. So please share your precisions when you have some new ones ! Design #39 and last of the Luders 5.5 design list.